The wind was blowing out of the east, which made the beast uneasy. It wasn’t normal. And anything that wasn’t normal made him uneasy. A stray sound. A flutter of a branch. The wind coming from the east. But there was a scent on this wind. A familiar scent. One embedded in the big stallion’s being for millions of years. He spun on his heels and sure enough, there it was, easily within sight, apparently not realizing the wind had shifted. The stallion screamed to the matriarch who wheeled in flight. Like one, the herd followed, racing away at lightning speed, the great stallion bringing up the rear. They ran without looking back for just over a quarter of a mile before the leader slowed and turned. The predator, a small female cougar, had tired. She had been betrayed by the east wind. The horses had gotten away early, and now she was turning back. The stallion’s senses had saved them this time. The entire herd was alive and well because those very senses had helped their ancestors survive for some fifty-five million years. Prey, not predator, the horse must suspect everything. Every movement. Every animal. Every smell. Every shadow. All are predators until proven innocent. By taking flight, not staying to fight, they survive. And by staying together. Always together. How well the big stallion knew this. He had watched his mother, in her old age, lose this very special sense and drift away from the herd. It was excruciating. His responsibility was the herd. To keep them together, and moving. But his mother’s screams in the distance would live with him forever. The matriarch began to lick and chew, a sign that she was relaxing, that all was well. The stallion took her signal, and one by one, the herd began to graze again, nipping at the random patches of grass and the occasional weed. But they wouldn’t stay long. The matriarch would see to it. She would move them almost fifteen miles this day foraging for food and water, staying ahead of wolves and cougars. And keeping themselves fit and healthy. Monty is an amazing man, with an incredible story. His book The Man Who Listens to Horses has sold something like five and a half million copies and was on the New York Times best-seller list for 58 weeks! 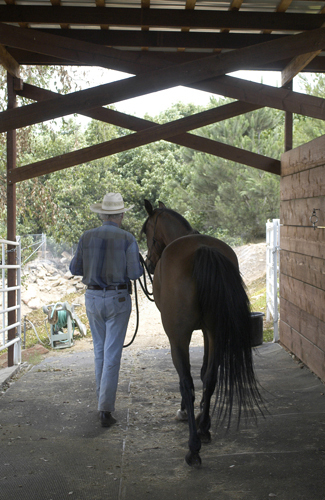 You might know him as the man who inspired Robert Redford’s The Horse Whisperer. I ordered his book and a DVD of one of his Join-Up demonstrations the minute I got home, and was completely blown away. In the video, he took a horse that had never had as much as a halter on him, never mind a saddle or rider, and in thirty minutes caused that horse to choose to be with him, to accept a saddle, and a rider, all with no violence, pain, or even stress to the horse! In retrospect, for me, the overwhelming key to what I saw Monty do in thirty minutes, is the fact that the horse made the decision, the choice. The horse chose Monty as a herd member and leader. And from that point on, everything was built on trust, not force. And what a difference that makes. My first encounter with this lesson was way back when I was making the original Benji movie, our very first motion picture. On a trip from Dallas to Hollywood to interview film labs and make a decision about which one to use, I discovered that intelligent, conscientious, hardworking people can sometimes make really big mistakes because they don’t ask enough questions, or they take something for granted, or, in some cases, they just want to take the easiest way. In this case it was about how our film was to be finished in the lab, and my research had told me that a particular method (we’ll call it Method B) was the best way to go. Everyone at every lab I visited, without exception, said, Oh no, no. Method A is the best way. When asked why, to a person, they all said Because that’s the way it’s always been done! In other words, don’t rock the boat. Not good enough, says I. My research shows that Method B will produce a better finished product, and that’s what we want. I almost fell out of my chair. For you youngsters, David Lean was the director of such epic motion pictures as Dr. Zhvivago and Lawrence of Arabia. I had my answer. And, finally, I knew I wasn’t crazy. It’s still a mystery to me how people can ignore what seems so obvious, so logical, simply because it would mean change. Even though the change is for the better. I say look forward to the opportunity to learn something new. Relish and devour knowledge with gusto. Always be reaching for the best possible way to do things. It keeps you alive, and healthy, and happy. And makes for a better world. We were only a year and a half into this voyage with horses as these words found their way into the computer, but it was an obsessive, compulsive year and a half, and the wonderful thing about being a newcomer is that you start with a clean plate. No baggage. No preconceptions. No musts. 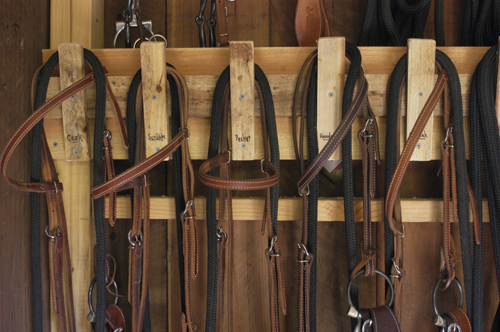 Just a desire to learn what’s best for our horses, and our relationship with them. And a determination to use logic and knowledge wherever found, even if it means exposing a few myths about what does, in fact, produce the best results. In short, I’ll go with Method B every time. I was no longer a horse owner. I was a friend, a partner. A leader. And I promised him that day that he would have the very best life that I could possibly provide. There was only one problem. I didn’t have the vaguest idea what that was. The big palomino stallion was anxious to leave, but the matriarch of the herd was scolding a young colt. And the time it took must be honored, the discipline performed, or the colt would grow up a selfish renegade, of no use to the herd, and would most likely wind up prey to a cougar or a wolf. After the earlier run, the colt had been feeling his oats, adrenaline and testosterone pumping, and he had snapped and kicked at a couple of foals half his age. Not really meaning any harm, but it was unacceptable and dangerous behavior in the herd and had to be dealt with. The mare had squared up on him, her back rigid, ears pinned, and her eyes squarely on his. He knew exactly what she meant, and he now stood alone, well away from the herd. Alone was the scariest place for a herd member to be. Without the protection of the herd a pack of wolves could easily have their way with him. Before he would be allowed to return, however, he would have to demonstrate his penitence and the mare would eventually swing her back to him and relax, saying the apologies were accepted and he could rejoin the group. The dominant mare, the matriarch, is the leader of the herd. Usually one of the more mature horses in the group, she serves as disciplinarian, dictates when and where the herd will travel, has the right to drink first from watering holes, and always claims the best grazing. The stallion is the guardian and protector. And the sire of every foal. The great palomino was taking this quiet opportunity to wander through the herd and check his subjects after the run. It had surely been good exercise, and a sniff here and a look there confirmed for him that there had been no injuries. The steep rocky terrain had conditioned their hooves and legs into appendages of steel. Their daily movement kept the blood flowing and the muscles toned. They were indeed a hearty bunch. But they had to be, for being so was their only defense. The stallion scanned the horizon, turning a full circle. The sun was low in the west and sometimes caused objects to become mere dark shapes against the light, difficult to distinguish one from another. But one particular shape on a distant ridge stopped him. It hadn’t moved, but didn’t really look like a rock, or a plant. He sniffed the air, but the wind was still coming from the east, and there was no scent other than the sweet smell of Indian paintbrush on the hillside. The stallion waited. And his patience paid off. The dark shape moved. Turned. His heart began to pump and his nostrils flared. The most feared predator of all! More dangerous because he came astride one of their own, on a horse, capable of running as fast and as far as the herd itself could run. It was a man! Over the past year, only two herd members had been lost to cougars or wolves, but five had been lost to man. All emblazoned upon the stallion’s memory. Long withering chases ending in herd members being slung to the ground, legs tied, whipped and dragged around until there was simply no fight left in them, their bodies and their beings stripped of strength and dignity. The stallion slid up next to the matriarch, adding his burning stare to hers. Saying to the young colt: Now! The recalcitrant colt began to lick and chew, and he lowered his head. The two leaders turned their backs, allowing him to return. The matriarch had also seen the figure on the ridge. She uttered a low guttural call to the herd. She must now determine which way to lead them. Certainly not back toward the cougar. Her instincts told her to go south. She glanced back at the western ridge. The dark shape was gone. There was no time to waste. How did we get here? How is it that we have taken this majestic animal which is fully capable of keeping himself in superb condition and living a long, healthy, happy life, and turned him into a beast of convenience, trained by pain and fear, cooped up in a small stall most of the time, subjected to a host of diseases caused, in most cases, by us. One would think that the long history of the horse’s value to man, as beast of burden, draft animal, riding animal, and companion would have stirred such a thorough knowledge of his needs that he would have a better, healthier, longer life in our care than he ever could have in the wild. But, in most cases, the exact opposite is true. According to Dr. Hiltrud Strasser, noted veterinarian, researcher, and author, horses in the care of man have a life expectancy that is, for the most part, only a fraction of that of their wild-living counterparts. Usually because of problems with their locomotor organs. In other words, lameness. Caused by wearing metal shoes. And standing around all day in a tiny box stall. Is that a surprise? It was to me. A big one. And it propelled me onto a journey of discovery that quite simply upended everything I thought I knew, and virtually everything I was being told by the experienced and the qualified. What I discovered was that most humans who own horses have no idea about what’s at stake—or what the alternatives are. They’re just doing what they’ve been told to do with no concept that they are causing emotional and physical stresses that depress and break down their horse’s immune system, cause illness and disease, and shorten life. And, in so many instances, prevents any kind of real relationship between horse and man. Dr. Strasser is emphatic that, no matter what you’ve heard to the contrary, the horse living in the Ice Age, the present-day wild horse, and the high-performance domestic breeds of today are all anatomically, physiologically, and psychologically alike. They all share the same biological requirements for health, long life, and soundness. In other words, we could not only be making the horse’s life as good as it is in the wild, we could be making it better. At least as healthy. And happier! Finding answers to these questions became the mission. The discoveries were mind boggling. The solutions remarkably uncomplicated, more often than not involving little more than a willingness to change. A willingness that, bewilderingly, all too often, wasn’t going to happen. Leaning on the fence next to me, elbows propped on the top rail, was a true cowboy. Gnarled and weathered, crusty as they come, and a likable sort. Full of tales and experiences. He must’ve been near my age and had been riding since he was old enough to hold on. I actually paused long enough to absorb the moment, me with my Boot Barn boots and new straw hat, right there in the thick of it. Me and him. Cowboys. Then he spoke for only the third time since Mariah had come out of her stall, and the reverence I was feeling cracked and shattered like the coyote in a Roadrunner cartoon. It made me uneasy, but I said, “No thanks.” It was that thing about choice again. Trying not to seem so much like a predator by racing into the stall and slapping the halter on first thing, horse willing or not. But I couldn’t push away the feeling of embarrassment. Even incompetence. As if I were being challenged. I knew I could corner her and catch her. The stall wasn’t that big. But I was attempting to stir some sort of relationship. Not my will over hers, like it or not. Finally I took her willingness to just stand still as an offer, and I slipped the halter over her head. She made no move to help. I rubbed her forehead. Then her shoulders, belly, hips, and again her face. She twitched, and pulled away, showing no warmth whatsoever. I led her into the cowboy’s arena and turned her loose. It was a small arena, but too large for a real Monty Roberts kind of Join-Up. Still, I had to try. I wanted to see if I could break through the iciness. When I unsnapped the lead, she took off like I was the devil himself, galloping full stride around and around and around. For the most part, I was just stood there, doing nothing, mouth agape. “No, it’s okay,” I mumbled, feeling like I was the one on trial, not Mariah. And she continued to run. I made a couple of token tosses of the lead line, but they were quite unnecessary. She ran on for a good seven or eight minutes with no apparent intention of stopping. I was getting dizzy. Finally I quit circling with her, turned my back to the biggest part of the arena, dropped my shoulders, and just stared at the ground. And on she ran. Around and around. I felt the cowboy’s eyes on me, probably saying: What kind of an idiot are you? Get a grip and catch the horse! I was running out of will. But Mariah wasn’t running out of gas. I was ready to give up when quite suddenly she jolted to a halt. Just like that. Maybe ten or fifteen feet behind where I was standing. I just stood there, staring at the ground. After a moment or two, she took a few steps toward me, then a few more. Monty’s advice notwithstanding, I was peeking. She never did touch me, but she did get within a couple of feet and just stood there. Finally I turned to her, rubbed her forehead, and snapped on the lead rope. I wanted to feel pleased, but didn’t. It was willingness without emotion. Her eyes were empty. Like an old prostitute. I know the gig. Let’s get on with it. The cowboy then climbed aboard to demonstrate Mariah’s skills. I suspect he was on his best behavior. He didn’t appear to be particularly hard on her, but I noticed that his spurs seemed about two feet long and he did use them. She performed cleanly. Then it was my turn in the saddle. Mariah pretty much did whatever I asked, but all the while, her lips were pouty and her ears were at half mast. Neither fish nor fowl. Not really showing any attitude, good or bad. Simply not into it. Not caring, one way or another. Kathleen was next, woman to woman. I think she did. And, now, so did I.
Clinician Ray Hunt opens every clinic or symposium the same way. “I’m here for the horse,” he says. “To help him get a better deal.” He and his mentor, Tom Dorrance, were the first to promote looking at a relationship with the horse from the horse’s viewpoint. Mariah’s owner wasn’t willing to do that. His question would likely be: What’s in it for me? Rather than, What’s in it for the horse? Perspective is everything, I was discovering. And I wanted desperately to change the perspective of the old cowboy. But what did I know? I was a newbie. A novice. Why would the cowboy or anyone else listen? I felt so helpless. As Kathleen dismounted, I looked deeply into this horse’s eyes. I rubbed her, and the closer I got, the more she would turn her head, or step away. I tried to get her to sniff my hand, or my nose. That’s what horses do when they greet each other. Sniff noses. All six of ours now go straight for the nose when we approach. Blow a little, sniff a little. And we return the greeting. Much nicer than the way dogs greet each other. I reached out one last time to rub Mariah on the face, and she pulled away. Just enough. I turned to leave and quite without warning she stretched out and nuzzled my hand. Well, maybe it was more of a bump than a nuzzle. But as I turned back to look at her, it became very clear to me that this cute little mare had received everything I had given, she just had no clue what to do with it. Trust had never been part of her experience with humans. The silence telegraphed my surprise. It seems that during her ride Mariah had spooked a couple of times at the dogs barking on the far side of the arena. That, plus the lack of any kind of warmth, had done it for her. Her blink, her first impression, was no. Two weeks before she had been right on the money. I was all wrapped up in a palomino because he was gorgeous, but I was overlooking at least forty-six shortcomings. “What don’t you like?” I had queried. “Why would you even ask?” she said. And she was right. It was the wrong horse for us. Kathleen and I had a deal. We would buy no horse that we didn’t agree on. But Mariah was different. I had finally seen a tiny light in the window. Until later I would have no idea how much she had been saying with that one little bump of my hand. How much of a call it was to take her away. Away from the cowboy. I told Kathleen about the smidgen of connection, trying to open her mind, but it was locked tight. I felt depressed. I was certain this little mare, given the choice of Join-Up, along with time and good treatment, would come around. She would begin to understand what trust was all about. But I dropped the subject and it was very quiet on the long road home. The next morning as we sat with our cappuccino looking out over the horse stalls, I brought up the subject again The next morning as well. And the next. I was haunted by that vacant look in Mariah’s eyes, and the little bump of my hand. A cry for help. Which I believe to this day it was, but probably not as passionate a plea as I was portraying to Kathleen. She arrived the next day. 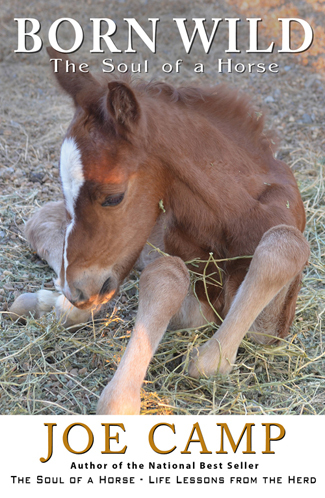 I was excited and anxious to get started, confident that the sincerity of my desire and my extensive working knowledge of the Join-Up concept – approaching a full month now – would win this cute little mare over immediately. I took her straight to the round pen. She ran around and around, just as she had done the day we met. But no signals of any kind were forthcoming. After several minutes, she clearly wanted to stop, but she had not given me an ear. No licking and chewing. Nothing. So I kept her moving, wondering what I might be doing wrong. Perhaps she didn’t know the language of the herd. Maybe she had never known a herd. Doesn’t matter, I objected. She’s a horse, with fifty-two million years of genetics. It’s in there somewhere. Has to be. I was beginning to reel with dizziness as Mariah continued to run circles around me. Finally, I gave up, put her in a stall, and retreated to the house to watch Monty’s Join-Up DVD again. If I was making a mistake, I couldn’t find it. Maybe Kathleen had been right. Maybe we shouldn’t have purchased her. Maybe she’d had so much bad treatment that she simply couldn’t respond to anything else. Back to the round pen, and more circles. Two days of circles! Still no rain. I was determined that she was going to figure this out. But I was also becoming more and more convinced that she might very well have never been exposed to a herd; perhaps one of those horses who had spent her entire life in a stall, with no need for her native language. No opportunity to communicate with horses, and no desire to communicate with people like our friend, the cowboy. Finally, on the third day, there was a breakthrough. Something clicked. After eight or nine trips around the round pen, her inside ear turned and locked on me. Then came the licking and chewing. Soon her head dropped and she began to ease closer. I let her stop, turned my back, and lowered my shoulders. Nothing happened for several minutes and I was about to send her off again when suddenly she walked up to me and stood, nose to shoulder. No sniffing, like Cash had done. But at least she had touched me. Of her own choice. And now she was just standing, instinct in control, but with no apparent understanding as to why. It was enough. I was grinning from ear to ear. I turned and rubbed her forehead and this time she didn’t pull away. As I walked across the pen, she followed, right off my shoulder, making every turn I made. I gave her a good rubbing all over. Belly, back, hindquarters, everywhere. And I blew in her nose, and sniffed. She didn’t respond, but she didn’t move away either. I could almost see the wheels turning. Do I know this greeting? Why’s he doing that? I don’t hate it really, but I’m not sure what it means. It does seem familiar. Somewhere, deep down in her brain, her genetics were finally bubbling to the surface, freed at last from the perspective of the old cowboy. The next morning when I went down to the stables to feed and muck, I realized for the first time how completely the Join-Up process had transformed Mariah. She was a different horse, waiting by her stall gate, head stretched toward me, and she didn’t move until I came over and gave her a sniff and a rub. A scratch under her jaw at the bend of the neck was her favorite. It became ritual. Every morning. And I dared not ignore her or she would scold me with a soft whinny or a snort. And then pull away when I finally came over, just for a moment, to let me know I had been naughty. The simple act of giving her the choice of whether or not to be with me, of viewing all of her issues from her perspective, not from mine, had changed everything. The new Mariah is as affectionate as Cash, as willing and giving, as anxious to see us… and until Skeeter came along she was Kathleen’s favorite. I can’t help but wonder what the old cowboy would think if he knew that Mariah had learned what it means to trust. 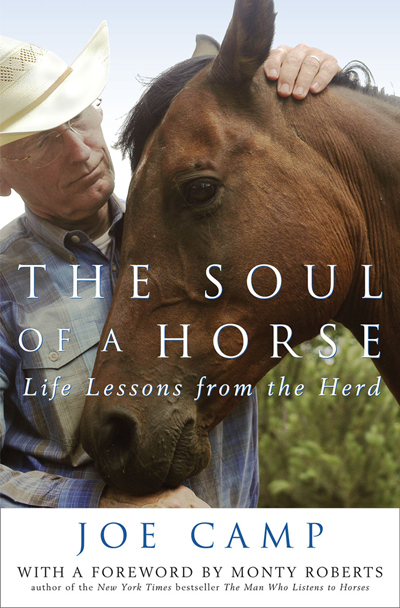 Joe Camp’s best seller The Soul of a Horse-Life Lessons from the Herd, now in its 14th printing, has been turning the horse world on its ear and changing the lives of horses and people all across the planet since its publication. Critical and reader acclaim for The Soul of a Horse from over 250,000 readers has generated a profound impact on the way horses are being trained, kept, and cared for all across the planet.